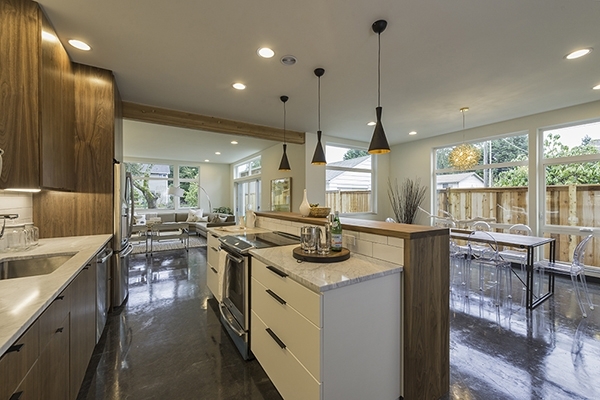 For the third year, the US Department of Energy has chosen TC Legend Homes for one of its Housing Innovation Awards in the "Custom for Buyer" category. Check out the photos of the award-winning zero-energy project. Walls: R-29, 6" SIP taped at all interior and exterior joints, fiber cement siding. Roof: R-42, 10" SIP taped at all interior and exterior joints. Ice-and-water shield, asphalt shingles. Foundation: R-23 ICF stem walls, R-20 rigid foam under slab. Windows: Triple-pane, vinyl-framed, low-e windows, U=0.21. HVAC: Evacuated tube solar hot water and 4.5 COP air-to-water heat pump for in-floor radiant hydronic heat. Hot Water: Air-to-water heat pump, 4.5 COP. Appliances: ENERGY STAR refrigerator, clothes washer, range hood; induction cooktop. Solar: 9.5-kW PV, evacuated tube solar hot water. Water Conservation: Low-flow fixtures; centrally located water heater. Other: Low-VOC paints and finishes. Electric car charging station. Download the US Department of Energy poster.